Trash-talking increases the psychological stakes of competition and motivates targets to outperform their opponents. 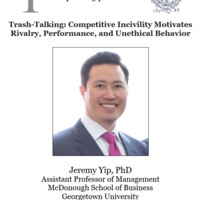 In Studies 1 and 2, participants in a competition who were targets of trash-talking outperformed participants who faced the same economic incentives, but were not targets of trash-talking. Perceptions of rivalry mediate the relationship between trash-talking and effort-based performance. In Study 3, we find that targets of trash-talking were particularly motivated to punish their opponents and see them lose. In Study 4, we identify a boundary condition, and show that trash-talking increases effort in competitive interactions, but incivility decreases effort in cooperative interactions. In Study 5, we find that targets of trash-talking were more likely to cheat in a competition than were participants who received neutral messages. In Study 6, we demonstrate that trash-talking harms performance when the performance task involves creativity. Taken together, our findings reveal that trash-talking is a common workplace behavior that can foster rivalry and motivate both constructive and destructive behavior.